Click on the banner to view this month's specials! Our museum quality artist panels are handcrafted with pride in the USA! All of our plein air panels are handcrafted using the finest Claessens® Belgian linen and cotton or Red Lion® polyflax canvases mounted on the highest quality Baltic birch plywood, Gatorfoam® and Hardboard substrates available. Our archival art boards offer a lightweight, portable, and durable surface perfect for use in the studio or en plein air (in the field). These professional-grade panels are ideal for use with pochade and wet panel storage boxes. You will be pleased with our customer service, premier quality, competitive pricing and unsurpassed delivery! Four canvases, six substrates and twenty-seven standard sizes = 648 different canvas panels to choose from. This e-x-p-a-n-d-e-d selection offers the most flexible solution for painting supports available today. Plus, if you have a custom panel requirement just contact us for a quotation. We handcraft custom orders every Tuesday! Visit the Specials page or our Online Store for More Information. Our Featured Artist . 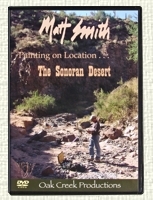 . .
"Painting the Effects of Late Light"
Click here to order your DVD! 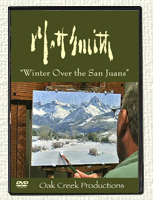 "Winter Over the San Juans"
Visit our Online Store To See Our New Products! We offer free standard shipping for orders over $500 net (excluding oversized packages - see description below). This applies to all orders shipped to the contiguous USA. Hawaii, Alaska and international rates will be higher. For large and oversized orders (including and above 18"x24" and rolled linen), we are happy to make custom boxes, crates and tubes at no addional charge. However, UPS shipping charges will be billed according to their current rates. Copyright © 1999-2018, All rights reserved. No portion may be used without permission. All visual copyrights belong to the artists.